There many different ways you can listen either at your computer, tablet or on the go! 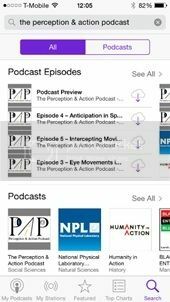 2.In the search box type “Perception Action Podcast"
News: Are coaches using too much sports technology to evaluate players? How do police officers handle the pressure of a high speed chase? 7A – Is Listening to Heavy Metal Music Bad For You? News: Is listening to heavy metal music bad for you? 7 – What Should an Athlete Pay Attention To?